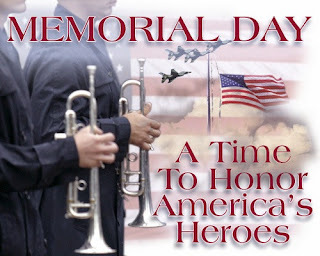 Today is Memorial Day, a holiday in the USA (yeah!!!). Occurring on the last Monday of May, it is a day to remember those who died during active military service. There are several things citizens do to honor our military heroes. Many people visit cemeteries and memorials, placing the American flag at grave sites as well as displaying a flag outside their homes. Patriotic parades in cities and towns all over the country are also part of the scene. In conjunction, Memorial Day is usually considered the official start of the summer vacation season, even though the calendar says otherwise. In addition to being a day of remembrance, Memorial Day also includes picnics, barbecues, sports, and recreation. One remarkable tradition occurring on Memorial Day is the running of the Indianapolis 500, a 500-mile auto race (also known as the Indy 500). The event, promoted as The Greatest Spectacle in Racing, is considered one of the three most prestigious motorsports events in the world. Nevertheless, the sacrifices of our military heroes will always be remembered.